180 Gram Vinyl - items 650 to 675 Shop MyMusicFix!! "Neil Diamond, Hot August Night,Bang Years 1966-68, Home Before Dark - 3 Titles"
NEIL DIAMOND - HOT AUGUST NIGHT - BANG YEARS 1966 - 68 & HIS NEWEST LP THAT HAS GONE IMMEDIATELY OUT OF PRINT- HOME BEFORE DARK - ALL TITLES FACTORY SEALED 180 GRAM DOUBLE LP SETS AND EACH AN AUDIOPHILE PRESSINGS. A TOTAL OF 6 SIDES OF VINYL MOST TITLES NOW OUT OF PRINT - DON'T MISS OUT. FACTORY SEALED ORIGINAL RELEASE DOUBLE 180 Gram LP SET - High definition analog vinyl pressing for superior fidelity. The nicest thing you can do for your stylus and ears. The ultimate record - the way music was meant to be heard. NEIL DIAMOND TITLES - They're each very limited in their pressings and disappear with extraordinary quickness from the vinyl market. This causes prices to skyrocket because once they are gone, they are gone forever! Don't second-guess yourself with this chance to upgrade your collection because before you know it, the opportunity will have passed forever. HOT AUGUST NIGHT - TREMENDOUSLY RARE AUDIOPHILE PRESSING - ORIGINAL FACTORY SEALED Double 180 Gram LP SET RELEASE - THIS WAS THE 1ST PRESSING EVER ON 180 GRAM AUDIOPHILE VINYL - This is the ultimate Neil Diamond record. Not necessarily the best -- he's at his most appealing crafting in the studio -- but certainly the ultimate, capturing all the kitsch and glitz of Neil Diamond, the showman. And that also means that it's not just loaded with flair, but with filler, songs like "Porcupine Pie," "Soggy Pretzels," and "And the Grass Won't Pay No Mind" -- attempts to write grand, sweeping epics that collapse under their own weight. Still, that's part of the charm of Diamond and while it can sound unbearable on studio albums, it makes some sense here, surrounded by his pomp and circumstance. That spectacle is the great thing about the record, since it inflates not just his great songs, it gives the weaker moments character. And while this does wind up being a little much -- 21 songs, 24 on the 2000 reissue -- it nevertheless is the one record for casual Neil fans, after the hits collections, since this shows Diamond the icon in full glory. Track Listings 1. Prologue 2. Crunchy Granola 3. Done Too Soon 4. Solitary Man 5. Cherry Cherry 6. Sweet Caroline 7. Porcupine Pie 8. You're So Sweet 9. Red Red Wine 10. Soggy Pretzels 11. And The Grass Won't Pay No Mind 12. Shilo 13. Girl You'll Be A Woman Soon 14. Play Me 15. Canta Libre 16. Morningside 17. Song Sung Blue 18. Cracklin' Rose 19. Holly Holy 20. I Am...I Said 21. Soolaimon / Brother Love's 22. Travelling Salvation Show THE BANG YEARS 1966-68 - The Bang Years: 1966-1968 is the first comprehensive anthology of Neil Diamond's earliest work, and this splendid album has indeed been worth the wait. The songs on The Bang Years are the cornerstone of a recording career that endures to the present day, and all are presented in their original mono mixes. A great number are still familiar today; the four tracks "Solitary Man," "Cherry, Cherry," "Girl, You'll Be a Woman Soon" and "Kentucky Woman" merely comprise the opening salvo. In a nearly 50-year career, Diamond has written and recorded 37 songs that have hit the Top 40, and sold 128 million records around the world. 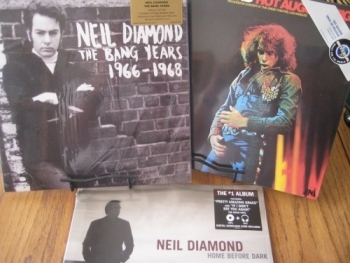 If there can be a definitive introduction to Neil Diamond, it's The Bang Years 1966-1968. These 23 examples of raw talent, pop songcraft and rock attitude have stood the test of time easily. This two-LP release also comes with a beautiful 12-page booklet. Talk about a bang for your buck! Solitary Man Cherry Cherry Girl, You'll Be A Woman Soon Kentucky Woman Thank The Lord For The Night Time You Got To Me I'm A Believer Red Red Wine The Boat That I Row Do It New Orleans Monday Monday Red Rubber Ball I'll Come Running La Bamba The Long Way Home I've Got The Feeling (Oh No No) You'll Forget Love To Love Someday Baby Hanky Panky The Time Is Now Shilo HOME BEFORE DARK - Remarkably Home Before Dark is the first US chart topping album of Neil Diamond's forty year career. It appears to repeat the formula behind 2006's acclaimed 12 Songs--relatively understated arrangements and a subtle Rick Rubin production. But Diamond, though sixty-seven years old and the oldest recipient of a Number One so far, is no Johnny Cash, turning his unique voice to some well chosen contemporary material. Instead Home Before Dark is a collection of new Diamond songs, and though they might not match the boomers in his back catalogue they are hardly stripped back. These are songs designed to fill large venues alongside the showstoppers in Diamond's still energetic live show. "Pretty Amazing Grace" is in the great tradition of Diamond songs that defy their corniness with sheer catchiness, as is "One More Bite of the Apple" while "Don't Go There" features bracing backing vocals and a delightfully dated wobbly guitar hook. The duet with Natalie Maines, "Another Day (That Time Forgot)", would fit comfortably on American country radio while "The Power of Two" sounds like another hit in waiting. In fact this is more a conventional Diamond collection than a Rick Rubin production, dominated by lightly understated country rock arrangements played by a crack team including Smokey Hormel, Heartbreakers Benmont Tench and Mike Campbell and the usually experimental Matt Sweeney. This is a charming and consistently solid set, though Home Before Dark does lack the unexpected intensity that made 12 Songs stand out so - Home Before Dark is the long awaited new album from legendary artist Neil Diamond. Home Before Dark was produced by legendary producer Rick Rubin who also produced Neil's critically acclaimed 12 Songs. There are two types of people in the world: those who like Neil Diamond and those who don't." - quote from the movie "What About Bob?" If you're in the latter category, please read no further. If you're still with me, this is a "pretty amazing" album from the evergreen Mr. Diamond, taking us back to his music of the seventies, namely the "Song Sung Blue" and "Sweet Caroline" period. There's also no complaining about the length of the album, as there are five songs that are six minutes and above, and only one track below four minutes. American Idol viewers would have been treated to a live performance of the single "Pretty Amazing Grace", and if you liked that one, you're really going to enjoy this album. Other recommended tracks are: If I Don't See You Again - the first song on the album, and the longest at 7 minutes 14 seconds. Another Day (That Time Forgot) - with Dixie Chick Natalie Maines Forgotten - lots of guitars Act Like a Man - a little Moon River, a little Country, pure Diamond Whose Hands Are These - a folksy, inspiring treasure with heavy guitar and piano backing No Words - you'll be hooked from the intro (personal favorite) This is vintage Diamond, and I predict a very good year indeed. Recommended - just recommended - buy it!! 1. If I Don't See You Again 2. Pretty Amazing Grace 3. Don't Go There 4. Another Day (That Time Forgot) 5. One More Bite of the Apple 6. Forgotten 7. Act Like a Man 8. Whose Hands Are These 9. No Words 10. The Power of Two 11. Slow It Down 12. Home Before Dark -------------------------------------------------------------------------------- International Buyers - Please Note: Import duties, taxes, and charges are not included in the item price or shipping cost. These charges are the buyer's responsibility. Please check with your country's customs office to determine what these additional costs will be prior to bidding or buying. Note: It's illegal to falsify customs declarations or mark an item as a "gift" in order to avoid customs fees INTERNATIONAL BUYERS NEED TO BE AWARE OF THE CUSTOM'S TAXES IN THEIR OWN COUNTRY AND KNOW THEY (AS THE BUYER) ARE RESPONSIBLE FOR CUSTOMS TAXES. OUT OF PRINT PRODUCT is IRREPLACEABLE and therefore NOT RETURNABLE. INT'L SHIPPING: We box/package protectively for safe world-wide shipping. When accepting PayPal, ship ONLY WITH EXPRESS MAIL FULLY INSURED or PRIORITY MAIL FULLY INSURED. International Buyers are responsible for their country's Customs Fees.